For more information about ActaTek Time and Attendance systems, please call our sales team on 02 9651 6000 or use the enquiry form. Time Clock & Bundy Devices for Australia. Stop loss of Profits and Expensive Labour Bills due to inconsistencies in the way employee time and attendance is recorded, ACTatek could save your organisation thousands of dollars each year. There is now a better way to track time and attendance of your employees with ACTAtek's hi-tech range of time clock and Bundy card devices. Designed to help maximise workplace productivity, our Bundy clocks enable accurate, reliable and accountable tracking of employee time and attendance. Track the hours worked by your employees with ACTAtek Bundy clocks. In addition to being a valuable tool for tracking employee time and attendance and measuring workplace productivity, our Bundy cards and time clocks provide support to payroll and human resources officers by decreasing valuable time spent by employees filling in the details of hours worked incorrectly. Whether you're in Sydney or elsewhere in Australia, contact ACTAtek today to find out how we can maximise your business and employees time and attendance figures with our time clocks, rostering management software, Bundy cards and other products. 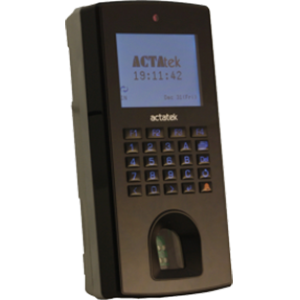 ACTAtek units are one of the most popular choices for both access control (AC) and time & attendance (TA) applications. Ease-of-use, no software installation and easy network connection create a simple yet sophisticated enterprise-wide platform for many system level software applications. Offering keypad PIN (Password), Smart Card and biometric Fingerprint Authentication options, the ACTAtek combination unit is used in both security (access control) and workforce management applications. A 24/7 security management solution that is easy to use and manage with simple access and download procedures via any standard browser. Its application software allows you to keep track of employee attendance and time attendance records, irrespective of geographical location. Moreover, ALL communication between the system and the web is extensively encrypted to provide additional security to users. ACTAtek supports 3rd party payroll applications for complex payroll calculations in various situations. The logs recorded are retrievable in Excel or TXT formats, or can be stored in ODBC format. It has the ability to generate reports and deliver useful information to the payroll software or service provider. The IN and OUT employee records avoids buddy punching problems faced by existing attendance systems.